Trump had lied for years about his dealings with the Russians, after his visit there in 2013 at the Miss Universe pageant in Moscow. (Repeatedly saying ‘No business with the Russians’, ‘I have no connections to the Russians’). 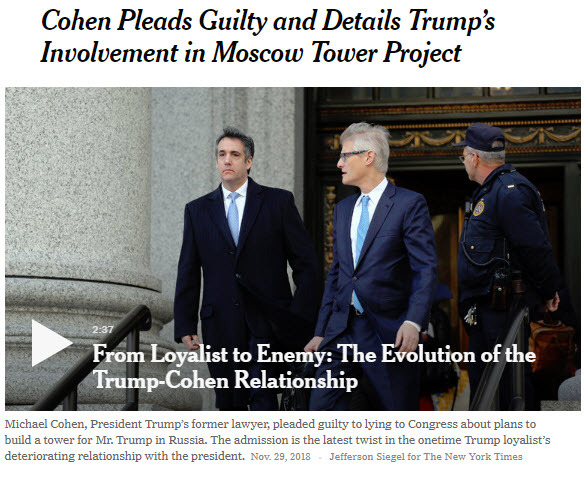 Today, Michael Cohen (ex-Trump Right Hand Man & Fixer) pleaded guilty to lying to Congress about Trump’s connections to Russia. Cohen had in fact been negotiating with the Russians about the Trump Moscow Tower hotel all the way through June 2016. Trump was already the Republican nominee for President at that time. Also, from Buzzfeed News: President Trump’s company planned to give a $50 million penthouse at the proposed Trump Tower Moscow to Vladimir Putin, as the company negotiated the luxury real estate development during the 2016 campaign. The point is that beside these shady business dealings (sanctioned Russian state bank VTB Bank was to finance Trump Tower), we also know the Russians had hacked the Clinton campaign’s e-mails, and that the Trump campaign & Don Jr met with them to discuss it in June 2016. The Russians exploited Facebook to interfere mightily with the 2016 presidential election. How extensive was Trump’s involvement and knowledge of all this? Reporting from today’s New York Times. History might very well look back at April 2018 (when Michael Cohen’s home was raided by the FBI), as the start of Trump’s undoing as President.